Canadian diver, journalist and publicist talks diving, movies and travel. Flickr, the social media service for photographers, is working with archives around the world to make their digital photo archives available to the world. Recently I took a dive through the New South Wales (AU) library files and found this picture of 18-year old Annette Kellerman. Kellerman, an Aussi by birth was a champion swimmer and starred in a number of dive/ mermaid films at the turn of the last century. In 1905 she invented the streamlined one-piece swimming costume for women, a liberating garment, which became her trademark. Known as the 'Diving Venus' and the 'Australian Mermaid', Annette Kellerman (1887–1975) was an athlete as well as a vaudeville and movie star, one of the most famous women of her day. She offered a powerful mix of innovative underwater performances, perfect physique, revealing costumes, skilful handling of publicity, and record breaking athletic feats. Some of her movies that included underwater scenes included: A Daughter of the Gods (1916), Venus of the South Seas (1924) and Neptune's Daughter (1914). Photograph Courtesy Hilton Cordell Productions and National Museum of Australia. 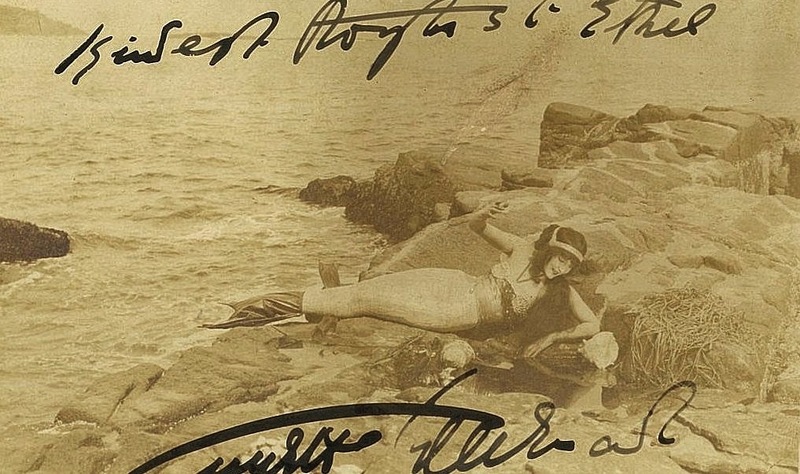 Tis Photo of Annette Kellerman was at Agar's Island in Bermuda during the filming of Neptune's Daughter in February 1913 - Annette was 27-28 in the photo, not 19. This Photo of Annette Kellerman was at Agar's Island in Bermuda during the filming of Neptune's Daughter in February 1913 - Annette was 27-28 in the photo, not 19.